I know I am posting the most random freebie today. I am working for a summer school, and the summer theme is traveling around the world. Each week we are focusing on a different country, and our first stop is Mexico! I made a Mini Unit Mexico Theme packet that you can download for free! There are 8 different sheets that are great graphic organizers to navigate through a Mexico theme. 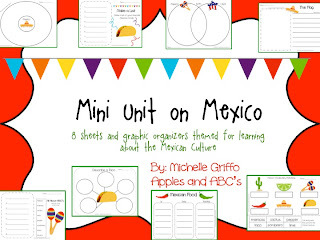 These will be great for a Cinco De Mayo Unit next year too! Head over to my TPT store to pick one up for FREE!!! :) Happy Friday! Thanks for sharing! I just found your blog and became your newest follower. I noticed on your profile that you are in Orange County, CA. I was born in CA (a long time ago!) and have relatives there. The last time I was there was in 1981! I'm sure it's changed a LOT! Fee free to visit my "new" blog: Teaching Kindergarten Kiddos.